The 1971 song by Don McLean "American Pie" tells the story of the day the music died. That day would be February 3, 1959. Frustrated by the travel problems Buddy Holly chartered a plane to save time and to avoid the cold bus ride of 380 miles from Clear Lake, Iowa to Moorhead, Minnesota. Shortly after take off the small plane crashed into an Iowa field killing three of the brightest stars of their generation; Buddy Holly, Ritchie Valens, and J. P. Richardson. Investigators concluded that the crash was due to a combination of poor weather conditions and pilot error. Buddy Holly, 22 years old at the time of his death, released only three albums in his lifetime, but his recordings and work would continue to be released decades after his death. Rock greats Bruce Springsteen, Bob Dylan, and Eric Clapton all mention Buddy Holly as an influence on their career. Buddy Holly achieved major rock and roll stardom in his very brief career and is best known for the songs "Peggy Sue" and "That'll Be The Day." Ritchie Valens was a pioneer of the Spanish speaking rock and roll movement. Although his career was cut short, Ritchie Valens was 17 years old at the time of his death, Valens had several hits and is best known for the songs "La Bamba" and "Oh Donna." 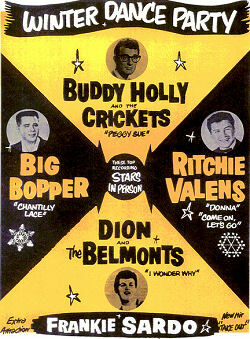 J. P. Richardson, Jr. better known as The Big Bopper was 28 years old at the time of his death. The Big Bopper was a rock music innovator who coined the term "music video" in an article back in the fifties and created the first rock video. Richardson is the songwriter of "Running Bear" sung most famously by Johnny Preston in 1959, and is best known for his recording of "Chantilly Lace" one of the most-played songs of 1958.